Cooking Planit Review: A 'Kids at Heart' Themed Dinner & a Cooking Planit T-fal Giveaway! I am so incredibly stoked to be a part of a huge 50+ blogger giveaway going on right now for a beautiful T-fal Stainless Steel with Thermo-spot 12-Piece Cookware Set! In a nutshell, I loved it! You really need to use this app to appreciate how fantastic it is (and I am so not just saying that, it was actually so fun to use and our meal was delish). 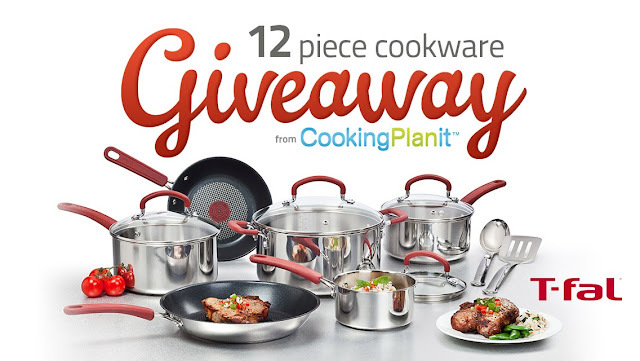 Registering for a FREE Cooking Planit Account is required to enter to win the cookware set, so head on over to their website here or go download it on your iPhone or iPad and try it out! You WILL NOT be disappointed. To be honest, I was a little skeptical about how the process would go, seeing as I'm usually cooking dinner with a 9 month old on my hip and a 4 year old bouncing around the kitchen. Let's just say things get a little...chaotic in my kitchen. Amazingly, I was able to pull of a complete meal from start to finish with the help of simple step-by-step instructions, all the way from prep right down to plating. Everything hit the table at the exact same time thanks to Cooking Planit, despite two incoming phone calls, my daughter's bouncing leading to falling down and and hurting her elbow, and a diaper change. First, I explored the site. 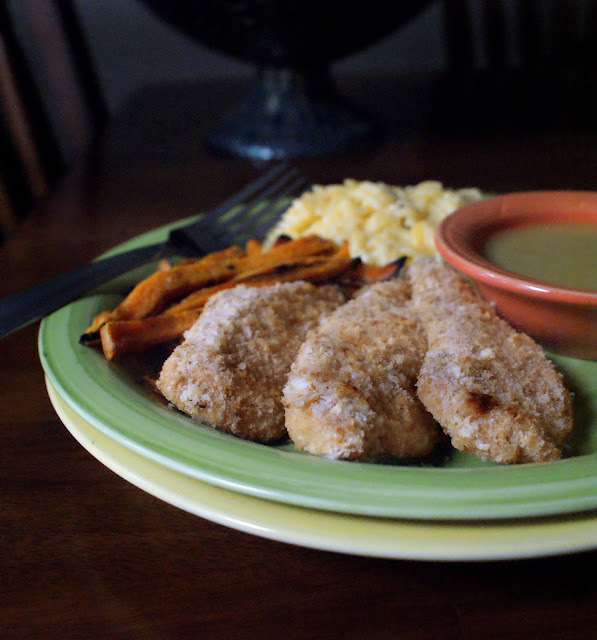 I decided to search "chicken tenders" because I had some chicken and I knew it would be a winner with my four year old. The Kids at Heart meal caught my eye and I knew right away it was the perfect meal for me to try out. I love that I was able to see the instructions from clear across the room. There are some smart cookies behind the scenes at Cooking Planit. Clear, concise, and easy to read directions. You just click Next Step when you're ready to move on. Then came the phone calls, diaper change, and needy four year old I mentioned earlier. As I kept getting sidetracked with the ongoing distractions I was thinking, "Oh great, now my whole timeline is going to be off and everything's going to get screwed up", but all the while Cooking Planit kept it's cool, seamlessly allowing me to move forward step-by-step at my own pace, making all the appropriate adjustments to my timeline (even adjusting the "Ready by" time so I knew exactly when dinner would be done). Awesome! It was like I had a personal cooking assistant in my kitchen with me keeping track of all the little odds and ends so my scatter-brained self didn't forget anything. There's even integrated kitchen timers. Ah-mazing. The app even told me to go have a glass of wine mid-preparation. My kind of app right there. The website is a virtual goldmine of single recipes and meal ideas accompanied by stunning photos (if you're a foodie, you know that looking at pictures of food is almost as gratifying as actually eating the food). You can put single recipes together to make customized meals, however there are a TON of meal ideas already created for you! You can filter meals by ingredient, occasion, dietary restriction, or course. It's easy to find what you're looking for. There is the option to make a customizable grocery list that is automatically sorted by the different areas of the grocery store. Super handy. Download the app and everything you do on Cooking Planit is synced between your desktop, iPhone or iPad so you can go from device to device with ease. Choose your recipes and make your shopping list on your desktop, then head to the store and everything is automatically right there on your phone when you get there. Come home and head to the kitchen with your iPad and use voice commands to tell the app when to "move on" to the next step. Very tech savvy. Love it. I've already added several other recipes to my Cookbook and I am really looking forward to using Cooking Planit again. It takes menu planning, grocery shopping, kitchen organization and cooking to a whole new level. Two thumbs up from The Two Bite Club! There are 50 bloggers giving away these sets of cookware. You can enter on every blog! My giveaway starts this Friday the 23rd, so be sure to check back to enter is LIVE! Click this link and use the Rafflecopter widget to enter!